I hope you are all having a great Friday. How bad can a Friday be right? I am literally pushing the boundaries of my all time blogging abilities and writing this post from Newark Airport (New Jersey) Ski Lounge. I hope to get it done until my flight to Amsterdam boards. April was definitely the month of travel for me. I am trying to keep up with the blog and thanks to my beloved friends (insert big hearts here) I was able to do so until now. 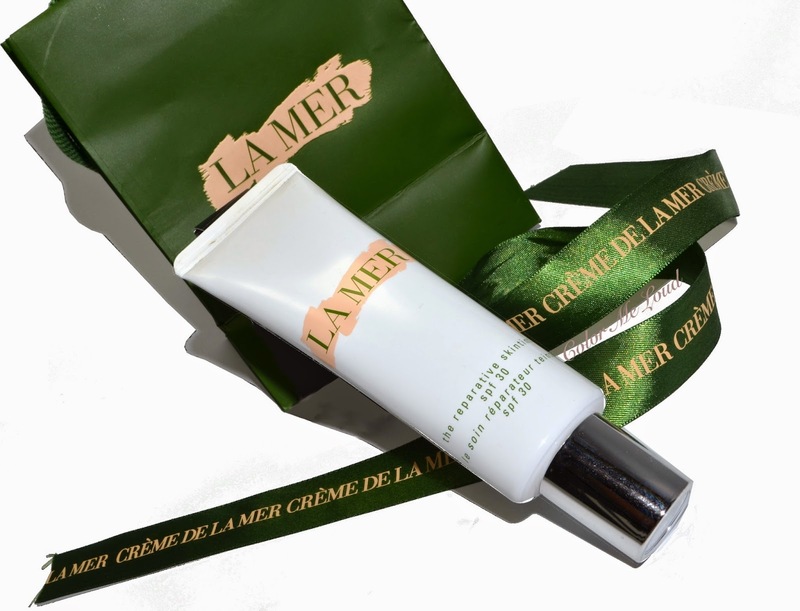 La Mer Reparative Skintint comes in a plastic squeeze tube and twist lid. Some would have wished for a pump dispenser, but personally I like this traditional packaging more. The reason is because it is also one way (as hygienic as a pump) and at the same time you can squeeze the last drop of product out. Sometimes with pumps, you end up wasting the bottom portion. The tube has 40 ml of product, which is slightly larger than average products in this category. These are usually 30ml. I found the best way to apply it is with fingers. The consistency is cream like and it is distributed easily. You have to give it a little bit of time for it to settle. During the first 10 seconds, it may look like it is sitting on the skin but eventually it gets absorbed. Although the application is quiet easy, it doesn't feel silicony at all, which was one of the surprises. That said if you are used to silicon based bases, you might find it not gliding too much during application. All in all thumbs up in this area, I am not a fan of full on silicon personally. 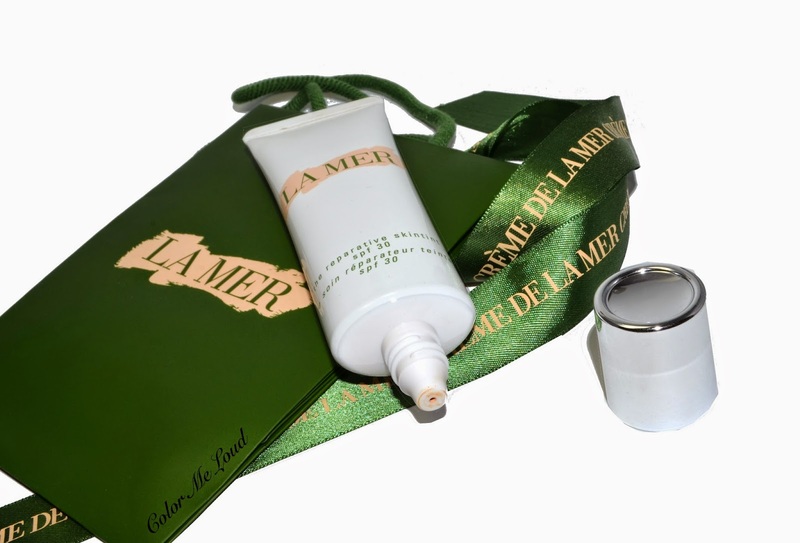 La Mer Reparative Skintint has a light coverage which is not too light so that it evens out the skin tone nicely. I was amazed to see how well the redness was evened out with such a sheer base. I guess La Mer products have to surprise me in one way or another. I can get away with this coverage as my main base and cover the blemishes and spots with a concealer. You can see below that the red spot near my nose, under my eye is not fully covered but it is not a problem to add tiny bit of concealer and get it done. I would classify the sheerness of La Mer Reparative Skintint to be sheerer than Guerlain Lingerie de Peau and Chanel Vitalumiere Aqua but more than Bare Minerals Complexion Rescue or Estee Lauder EE Cream. The finish is demi matte, which dries down to a rather matte finish but it reflects the light in a nice way so it doesn't look powdery. During application though I read the name of the product again "La Mer Reparative Skintint", so be aware this is meant to be applied over a moisturizer. It is not a tinted moisturizer. If you have dry skin like me, you need something rich under it for it not to emphasize your dry patches. If you have combination skin, I think you will love this product even more. Good news, it lasts forever. It is the longest lasting product I have tried in sheer and build-able category. There are four shades offered in Germany at the moment. The shade I tried is the lightest one called 01 Very Fair. This shade is a little light for my light to medium complexion but since it has some transparency and since I am super pale at the end of a long winter, it works on me just fine. 01 Very Fair is close to Chanel Vitalumiere Aqua B10. My perfect match on this category is Guerlain Lingerie de Peau in Light, which is a little cooler and a tad deeper than La Mer Reparative Skintint in Very Fair. I am also testing Bare Minerals Complexion Rescue at the moment, in shade 01 Opal, which is cooler than 01 Very Fair. All in all Very Fair has rather natural to warm undertones but since your skin shows through, it gives a little bit of warmth and doesn't look too yellow. I have already posted this FOTD of Estée Lauder Courrèges Collection, I was wearing La Mer Reparative Skintint with tiny bit of concealing only on my spots and Diorskin Star Concealer there. As you see the coverage is enough for me to be worn on its own. It feels very lightweight and skin like too. 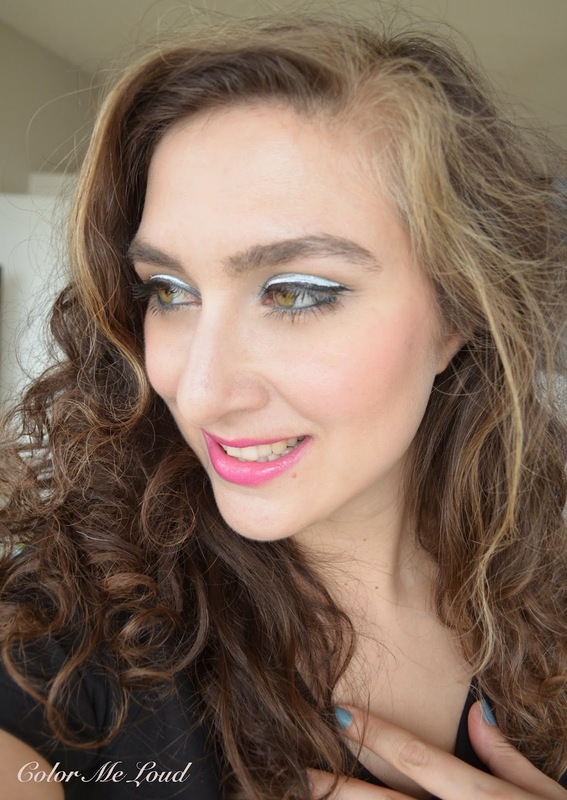 Check out the review of Linda at Silverkis, who was loving the previous formulation too. Final thoughts: I am amazed with how much La Mer Reparative Skintint evens out my skin redness with such a lightweight sheer formula. It also lasts all day and coverage is enough for me to wear it alone if I conceal the blemishes separately, which I anyway do. For the dry skinned ladies, this is not a Tinted Moisturizer so it is supposed to be worn over your moisturizer. That way you can get the best out of it. I think those with combination skin will love this product even more. 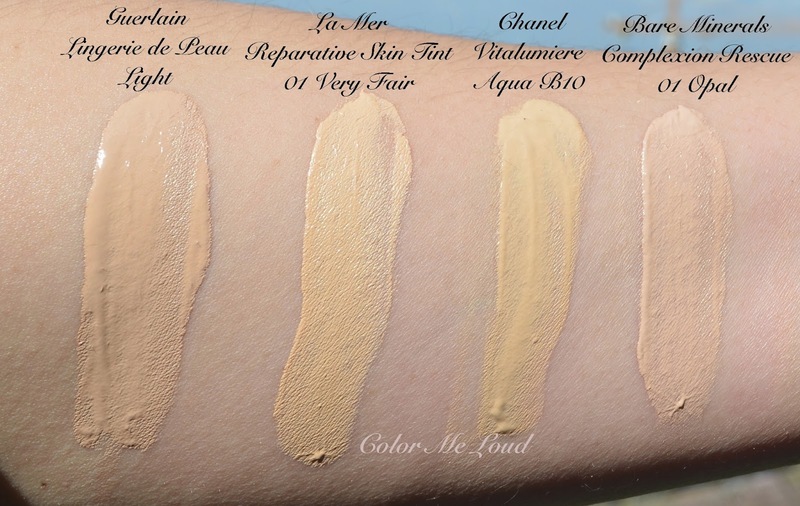 What is your favorite sheer coverage base? That looks great and I am glad you like it! 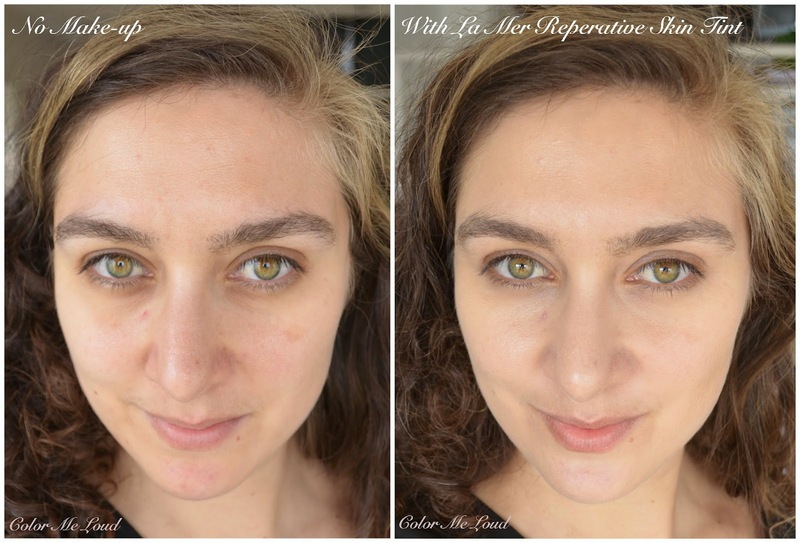 As far as sheer bases I have been also using Bare Minerals Complexion Rescue and I LOVE it! I can't wait to hear what you think of it! Hi Sara. I've been busy as well and I'm NOT travelling - I wish I was though. I haven't tried much from La Mer apart from their lip balm and that's mainly due to their price tag. I'm very impressed with the coverage of Skintint though, it evens out your skin beautifully. I really love it on you, looks great! It really looks great on you!